Don’t toss out your empty egg carton just yet! There are a 1000 and more ways you can reuse them for fun and learning and more! Here are cute egg carton crafts for kids. Use egg cartons to make these herbacious mini herb and plant pots. What a great way to introduce children to growing and caring for plants! Go to Parents.com to learn how to make the pots. I love this egg carton sewing kit! It’s perfect for keeping your sewing supplies neat and organized. Have your daughter or son decorate the outside if they’d like for an even more personalized kit. “Sew” crafty! Find more pictures here. Set sail on the Seven Seas with this fun egg carton pirate ship. My boys would have so much fun racing these down a stream or gutter! Get all the swashbuckling details here. There’s much to “sea” and do in the big, deep blue. Use an egg carton to make an ocean habitat biome for school projects or to use as a keepsake for your special beachy memories. What a fun way to keep your seashells and sand dollars! Source. You’ll have a check mate on boredom with a game of egg carton chess or checkers. You can make this adorable Easter set or come up with your own imaginative creations. Tanya Stabb shares more on her blog. Fairies and princesses will delight in making such fancy crowns as these! The flowers are an especially magical touch. Don’t let this fun craft pass you by! Add some fun and whimsy to your child’s room with a bit of a flower shower of sorts. Egg cartons can be cut and painted to look like colorful flowers and then hung with string to create these fun flower mobiles. Find this blooming idea here. Get creative with some flower power by making this egg carton wreath. It would be so fun for your little girl to hang this on her wall to remember a fun afternoon spent with mom! Home Serenity shares how to make your own. My students at school would LOVE this egg carton helicopter! What a heli good way to have fun while learning about forces and motion. Get the how-to from How We Learn. Wrapping paper is so last year with this fun gift display! 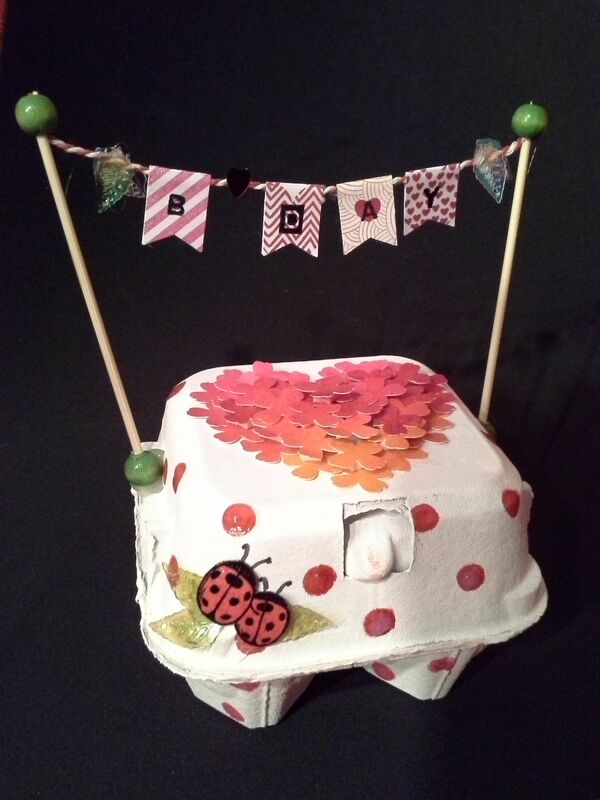 Fancy up an egg carton and place some special gifts inside to make this one-of-a-kind gift box. Image source. Craft an egg-cellent Valentine’s box this year using an egg carton, paint, and other crafty items. You could also place candies in the compartments as a way to share the love as well. What a creative way to say “B Mine”! DIY from She Knows. Plan a tea party and invite your guests with these fancy egg carton cards. The real tea bags make these pretty special little invites! Find the DIY here.